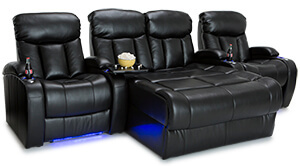 Before you settle for less than perfect, we’re here to remind you that you don’t have to. 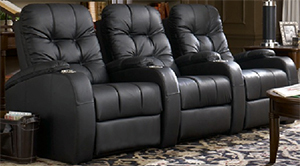 Any style you choose, in endless combinations with any of our honed selection of world-class materials and colors. 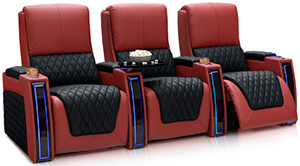 These chairs will be made perfect for you, by you; From the richest, most vibrant fabrics to our powerful, mesmerizing Top-Grain Leather 7000, we guarantee you will love it. 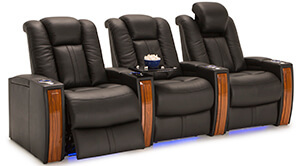 With years of intense, passionate design and craftsmanship expertise in each piece, we’re confident you won’t be able to enjoy sitting anywhere else after spending a single second in some of these masterpieces. 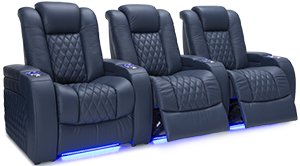 These seats are painstakingly fitted to meet your requirements. 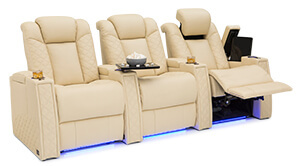 The seats in this category are always fully customized to suit each individuals need; It’s a simple three-step process: choose the material and color that’s right for you, from a wide array of available options. 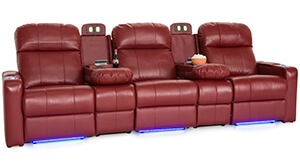 Then, choose a straight or curved row. 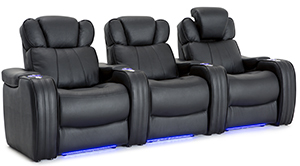 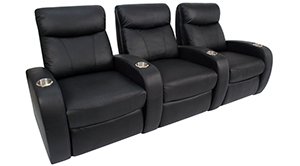 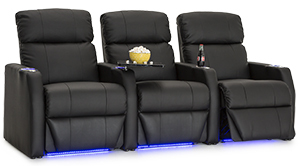 Finally, choose power or manual recline, and the seat of your dreams is ready to ship! 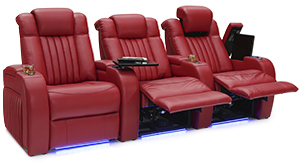 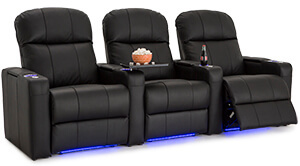 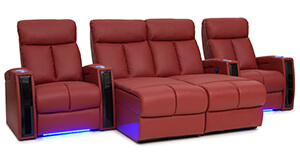 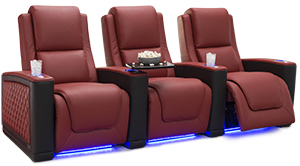 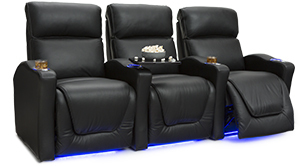 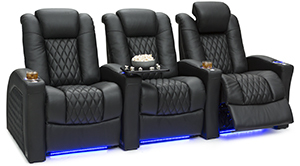 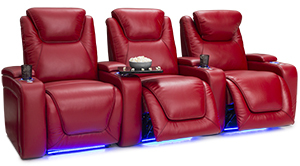 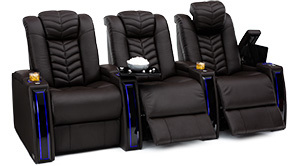 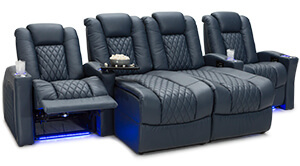 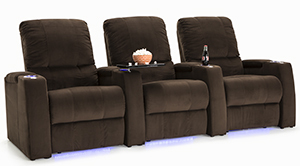 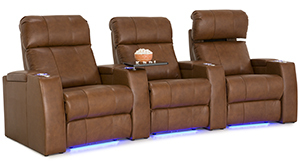 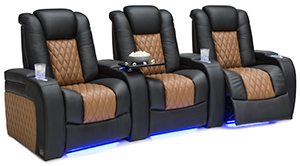 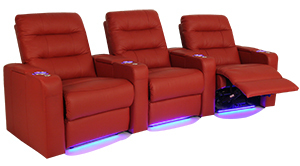 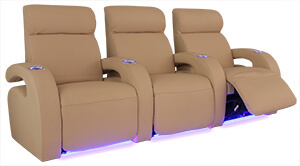 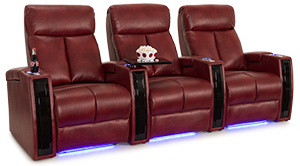 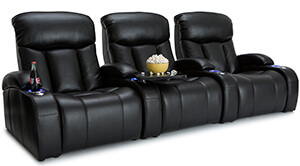 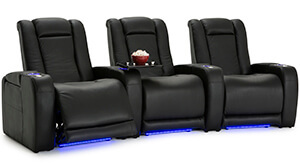 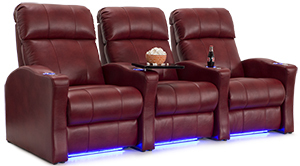 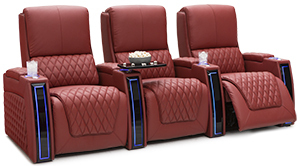 Now, you can build any of these home theater seats to perfectly match your theater’s decor style. 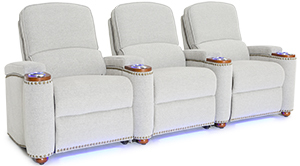 Kick back and relax on any of the following designs which support full length chaises for unprecedented support from head to toe, complete with power recline controls and USB charging on any of these all-embracing chaiseloungers. 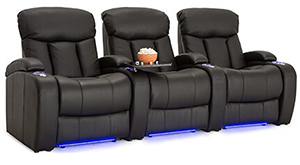 Any of these home theater sofas or loveseats have the functionality of entire living rooms inside a single, incredibly comfortable 3-seat transforming sofa or storage console loveseat made for two. 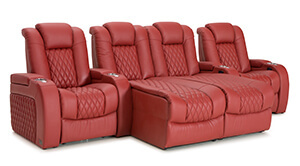 These crafted masterpieces combine quality engineering in feature-dense packages that make them destined to master the interchange of stylish media rooms, state-of-the-art features, and unbelievably comfortable furniture. 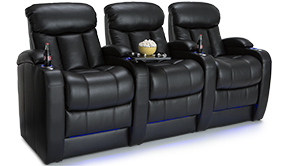 These media room sectionals are here to impress and create the perfect media room that most enthusiasts can only dream of. 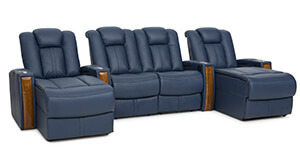 Whether a loved one in the household wants a comfortable place to plug their laptop in, or a place to binge in comfort while charging their phones, these full-sized sectionals have you completely covered with revolutionary features that you never thought a sectional could have.